Rebecca Zimmer, Global Director of Environment, Starbucks, speaking at the PSI Session: The Introduction of (Postconsumer) Coffee Cups into the Recycling Bin; a Point/Counterpoint. This year's 19th edition of the Paper & Plastics Recycling Conference North America, held in Chicago from October 17 through 19th and produced by the Recycling Today Media Group, was a very informative, well organized and well attended event, and a good reflection of the mixed feelings currently being expressed by the industry with respect to the state of paper and plastics recycling. On the technology side of the industry, things are largely positive. Business is good. From the latest plastics additive and stabilizing technologies designed to enhance the physical properties and thereby the quality of recycled plastics for compounders and other reprocessors, to the significant advances in sorting, screening and other equipment being put forward by leading manufacturers, it is clear that there is solid demand, and excellent solutions available to help profitably create better quality recycled materials from challenging input streams. The advances in this sector are in fact rapid and ongoing. The latest robotic and optical sorting, coupled with artificially intelligent (AI) "learning" technologies, are particularly impressive - making it difficult for anyone to deny that high-tech materials sorting has a huge role to play in the future of this industry. Where the recycling industry is feeling less positive is with respect to mixed paper and plastics end markets specifically. The topic of how the industry can best adjust to the new world order without China as a key market for these materials was at the top of the agenda all week in Chicago. While equipment manufacturers and technology providers as well as recyclers which do not deal in mixed plastics or paper remain relatively positive, processors of mixed paper and mixed plastics - especially numbers 3 through 7 - are feeling the crunch most intensely. Inbound contamination levels of mixed materials captured mainly through single-stream programs are as high as 20% or more in many jurisdictions, which means producing extremely pure material is costly and inefficient. • One highlight of the week was at the PSI Session Wednesday, sponsored and hosted by long-time conference partner, ISRI's PSI (Paper Stock Industries) and moderated by industry veteran, conference co-founder and paper recycling expert Bill Moore, President of Moore & Associates. Sustainability representatives from HAVI/McDonalds and Starbucks participated in a counterpoint format with two experienced MRF owner/operators and Linda Leone, VP, Northeast Region, Recycle, for Westrock - the paperboard mill operator and leading global paper and packaging firm - which does accept post-consumer fibre cups at eight mills in the U.S. The question: can post-consumer one-time use polymer and fibre-based coffee cups be included in the mix at the recycling plant? Currently, very few communities in North America accept the material. The restaurant brand representatives made great points about the efforts both McDonalds and Starbucks have made recently to try to engage with both consumers and the recycling industry to make their coffee cups more sustainable overall and acceptable for recyclers, including a partnership with the Foodservice Packaging Institute. Both companies are working hard to this end certainly. Currently, there are eight mills run by Westrock, as well as plants in Vancouver, Seattle and Washington DC, that are accepting their latest post-consumer coffee cups. By the end of the session however, after the recycling industry representatives responded with their experiences with post-consumer fibre coffee cups, it was clear that from their perspective, there is a long, long way to go. The issues, including food and liquid contamination with this category of container was the first issue pointed to which has so far contributed to reasons why both of the MRF recycling panelists (Mark Badger of Canada Fibers, and Kerry Getter of Texas-based Balcones Resources) have not accepted the material to date. Both were adamant that until post-consumer coffee cups (a mix of paper, ink and polymer coating) are profitable to recycle with sustainable end markets, it just wasn't an economically feasible category of container to accept at their plants. "For us, it's about cost of recovery and the ROI," said Balcones' Kerry Getter, "and it needs to be good enough for the mill." Mark Badger from Canada Fibers also mentioned the issue of trying to process paper that is saturated with ink, and which includes an inside polymer coating. The ink contaminates, to varying degrees, the paper portion of the cup. He pointed out that because there are three different materials in a cup, it can produce negative results during processing, including bale contamination as well as "confused" optical sorters, which can have trouble identifying what they are detecting. This can result in cups going to residue and then to landfill. His suggestion was that if cups were made with two layers of polycoat, both outside (with ink on the poly rather than the paper) and inside, with a layer of paper between, it would be a much better scenario for recyclers that need to produce very pure fibre output. Also, he noted, there needs to be the creation of a domestic closed-loop for the product, so it can go directly back into the manufacturer of new cups, and that for it to truly work, every manufacturer of single-use cups needs to produce cups to the same standards. He reemphasized that recyclers simply cannot process material unless it is cost-effective. • At a Thursday session titled "Alternate Markets to China - India, Indonesia, Vietnam, Mexico and Latin America", panelists included Steve Sutta, President, Sutta Co. (U.S.), Rogelio Silva, Director, Continental Paper Grading (Mexico) and Sung Soo Lee, Hansol Paper (South Korea). From the start, it was clear that, according to all three panelists, for mixed plastics and paper, there are simply no viable alternative markets that can act as a substitute for the loss of Chinese end markets. Alternate markets including Vietnam and India have already been saturated (in as little as six months) by the large volumes of mixed paper that cannot go to China. These markets are congested and there is a lack of infrastructure and capacity. So then the question becomes: why would any nation want to continue to take mixed, low-grade, hard-to-recover-for-high-value materials? There is no question that China has good reason not to take mixed materials which cannot be easily recycled, and which ultimately contribute to landfill "waste", as the country strives to clean up one of the most polluted environments on the planet. Why would other countries want to continue to take contaminated recyclables? "There is no market for mixed plastic, and it's not coming back," said Steve Sutta frankly. "Everyone is overwhelmed. The recycling industry needs to advocate for itself. The Exxons and the Duponts, the multi-billion dollar companies need to figure out a way to re-use the materials that they are producing, and take care of the problem they have created.... The party is over." I thought this was very well said, and I could definitely feel the frustration echoed on behalf of mixed plastics processors via Mr. Sutta's comments. On the paper side, Rogelio Silva commented on the capacity of Mexican markets for mixed paper as being way too low to provide a home for the tonnage that now needs a market on an annual basis. "Paper consumption is low in Latin America," he said. "The paper industry has to rethink itself, redesign its systems and processes. I think this is the moment to change what we do." He added that in Mexico, as in the U.S., and Canada, mills are being built, but it will take time to create the capacity. Interestingly, at the end of the session, one of the audience members stated that he is from Belgium, and wonders why there is so much talk about a lack of international end markets, when he sees many mills empty across the EU, and looking for material. Another asked the question: why are we focused on getting to an impossible purity specification for mixed paper and plastics of as low as 0.5% for an international market, and not entirely focused on building domestic mill and paper making capacity. This then raised the question as to how much the issues we currently face are economic, and how much they are political. Good question. • Bottom line takeaway for this Editor based on four days at this year's Paper & Plastics Recycling Conference North America: the recycling and waste management industry collectively needs to undergo significant change, monumental even, beyond the level of change that was made when the industry went from dual stream to single-stream collection, or when we saw the resulting MRF-boom of the 2000s. Following are a few more specific takeaways from last week in Chicago. PPRC TAKEAWAY 1: It remains clear that public education is needed as a first and ongoing step, so that all waste generators, residential and commercial, are engaged and understand the importance of helping to sort recyclables properly - so they retain the highest value possible and the industry can remain sustainable. If there needs to be penalties for non-compliance, or rewards for compliance, then so be it. But this is only one of the changes needed. One part of the equation cannot be the sole focus, and it would be naïve to put all the responsibility on waste generators to diminish recyclables contamination to adequate levels for profitable recovery. PPRC TAKEAWAY 2: There are also serious issues with labour in the recycling plant, including pickers, (and drivers on the hauling and collection side) which need to paid more so the industry can attract and retain good people. Automation is the future, but a revised, highly trained labour force is also needed. How well this is managed will play a key part in any updated version of the industry that is to come. Some MRF operators, at the Tuesday MRF Operations Forum (which preceded the Paper & Plastics Recycling Conference) told me their picking line turnover is as much as 30% monthly. It is a tough job to sort society's discarded materials, especially when minimum wage and contracted workers are the industry standard in many MRFs. PPRC TAKEAWAY 3: Perhaps the most important fundamental change that is needed in order to update our industry is that manufacturers of products - many of which are multi-million and multi-billion dollar entities - change the way they manufacture goods. Goods and products need to be made from more homogenous materials, so that recyclers can profitably process those goods at the end of their life, and recover their value. Without this change, it is honestly hard to believe that the industry can be sustained. There has to be some acceptance of responsibility at the ground level - where products with a pre-determined total lifecycle - are made. This means those producers of materials need to pay more for recyclable design and for the end-of-life management of their products ­ -- with the help of government at all levels - in order to sustain a profitable recycling industry. Without a profitable, functioning recycling industry, eventually waste will become overwhelming and everyone will have a very large problem. Beyond corporations, governments in particular need to realize that waste management, if we think long-term (and it need not be too long) is as essential (or nearly) as our roads and sewer systems, for example. They are all three a necessity for a well -functioning society, but roads and sewer systems are funded by tax dollars in every city on the planet, without question. Management of "waste" needs to be thought of similarly going forward, through funding and tax-based support of the recycling industry. Perhaps it is naïve optimism to think that governments and the producers of goods will somehow realize that global waste management is currently at a crisis point. Even if end markets in China suddenly reappear, we only have to look at the Pacific ocean garbage patch to confirm that there is a crisis in managing global waste. Whatever the case may be, the paper and plastics recycling industry, the collectors and especially the recycling plant operators which have been set up and are greatly invested in order to deal with mixed paper and plastics, are straining under the weight of carrying nearly the entire burden of dealing with these low-return materials once discarded. The recycling industry could use some serious attention and cooperation from all stakeholders, especially the producers of goods which continue to reap the rewards of their massive profits without taking full responsibility for their full cost. Only a few years ago the standards for recycled paper and board in China were not high. As a massive importer, China is now known to reject entire container loads based upon one inferior bale. Responding to this reality, Valorizaciones Vilar Guillén SL (V V G) set out to streamline their entire business to deliver against tight specifications, earning respect and repeat business as a result. The good news for recovered paper exporters as the calendar flipped to another new year was China's issuance of almost six million short tons worth of import licenses in December. The first batch of permits issued by China's Ministry of the Environment, covering about 5.5 million tons, was more than double the amount of recovered paper allowed by China's first batch a year earlier. Balcones Resources celebrated its 25th anniversary in business this month, growing from a small Austin-based paper recycler to a comprehensive environmental services company with facilities in Austin, Dallas and Little Rock. Balcones marked the milestone with a reception featuring a presentation of $25,000 in total donations to five Austin-area environmental organizations: EcoRise, Hill Country Conservancy, Keep Austin Beautiful, Shoal Creek Conservancy and Waller Creek Conservancy. Greif, Inc., a global provider of industrial packaging products and services, announced December 20 that it has entered into a definitive agreement to acquire Caraustar Industries, Inc., the leading recycled paperboard and packaging solutions company, from an affiliate of H.I.G. Capital, in a cash transaction valued at $1.8 billion. The transaction is expected to close during the first quarter of calendar year 2019, subject to customary closing conditions, including regulatory clearances. Mondi, a global leader in packaging and paper has partnered with One Young World, the global forum for young leaders, on the Lead2030 initiative - a competition to find youth-led practical solutions to drive progress on the United Nations' Sustainable Development Goals (SDGs). Mondi has committed $50,000 to fund a project that will make a tangible contribution to SDG12 ‘Responsible Consumption and Production'. The ReWall Company, which turns recycled food and beverage cartons into environmentally friendly building materials, is set to open a new facility in Colorado that will expand end markets for recycled cartons in the western United States. ReWall makes high-performance, sustainable building and construction materials out of recycled food and beverage cartons through a proprietary process that uses no chemicals or water. It takes about 400 cartons to produce one sheet of ReWall's hail-resistant roof cover board. This past summer, Van Dyk Recycling Solutions sponsored and hosted a webinar titled "MRFs in Crisis! Where do we go from here?" During the webinar, Van Dyk's sales manager and process Engineer, Adam Lovewell, along with colleague Mark Neitzey, focused on the topic of how recycling businesses have been struggling to deal with China's changes in import policy. According to Lovewell and Neitzey, the so-called "China crisis" has exposed serious issues throughout the recycling industry and "we have hit a critical point where owners and operators need to take a hard look at their equipment's ability to handle changes in the stream." 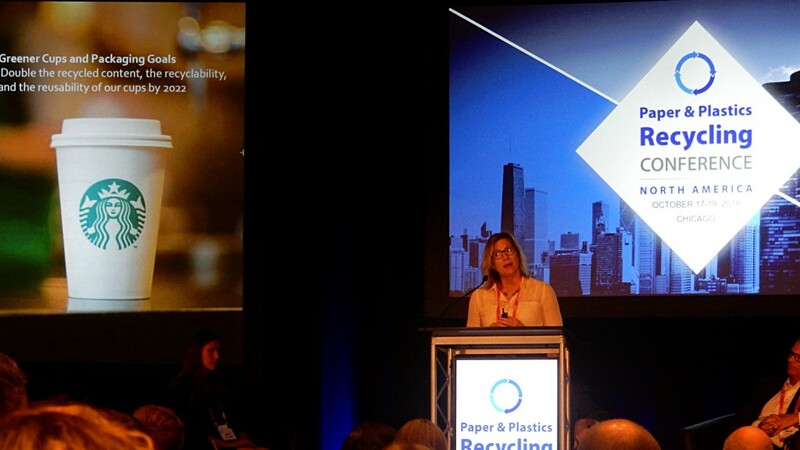 Recycling Today Media Group's 2018 Paper & Recycling Conference North America, the 19th edition, opened officially Wednesday, October 17 in Chicago, following the third annual day-long MRF Operations Forum dedicated to best practices at material recovery facilities. Jim Keefe, RT's Publisher opened the 2018 MRF Operations Forum Tuesday morning by welcoming approximately 100 attendees and introducing the first session: "Dynamic MRF Operations". The title is an appropriate one -- reflecting the overall theme for the day: with changing incoming recycling streams combined with changing global end markets, MRF operations need to be dynamic - adapting to changes and changing the way they operate - to maintain profitability. Epax Systems, a specialist in waste management with more than 30 years of experience, recently developed a new method to control industrial compactors and balers called Axxess controls. According to the company, over the last decade, safety and security have become concerns for multi-use property managers who are seeking to meet Occupational Safety and Health Administration's requirements for controlling balers and compactors in their facilities. Since 2017, clients of Epax Systems, inc. have increasingly communicated the need to improve on their traditional key switch systems, which requires employees to use an on/off key switch to control their compactor or cardboard baler. TOMRA Sorting Recycling has published a new e-book providing advice for businesses who sort paper and cardboard for deinking and recycling. The new online publication addresses the intensifying commercial and regulatory pressures for higher recovery rates of deinked pulp and the fact that meeting these demands will require new technical solutions. The e-book introduces an exceptionally effective new solution. National Recovery Technologies (NRT) has integrated the company's NRT SpydIR® optical sorter with Max-AI® technology, creating a revolutionary new sorter with detection abilities unmatched in today's optical sorter market, according to the company. NRT's SpydIR technology uses near infrared light (NIR) detection to identify plastics, paper, wood and other materials by material type. Max-AI technology uses artificial intelligence (AI) to identify materials using a camera and neural network algorithm (NN). The NRT SpydIR with Max-AI optical sorter employs both detection technologies to create an optical sorter that is able to combine the information from each technology to deliver a unique sorting capability. Binder+Co introduces unique sorting for light packaging; first machine operating in U.S. According to Austria-based Binder+Co, due to China's recently imposed scrap import restrictions, concerns are growing in Europe and in North America about how to cope with plastic waste. The industry is sceptical about reuse, because the required quality of secondary raw material is, for the most part, not ensured, and the use of plastic waste as alternate fuel in incinerators makes too little use of plastic as a valuable secondary raw material. Canada Fibers Ltd. (CFL) has announced that it has filed a statement of claim with the Superior Court of Ontario asserting damages arising from breach of contract by the City of Hamilton. CFL's decision to file the claim follows over 12 months of negotiations with Hamilton staff that culminated in a recommendation by the City's staff proposing measures to resolve the breach and end the dispute. Unfortunately, Hamilton City Council has rejected the compromise recommended by staff and made it necessary for CFL to seek a remedy in the courts. Norsk Gjenvinning (NG), Norways largest waste management company, has selected Oregon-based Bulk Handling Systems (BHS) to supply NG's new state of the art paper recycling system in Oslo. Operational in Q1 2019, the system will process 20 tonnes per hour (tph) and run three shifts to process approximately 120,000 tonnes annually. Noteworthy to this process is the inclusion of Max-AI VIS (Visual Identification System) units to monitor the quality of outbound paper. According to American Baler Company, the 8043 horizontal single-ram model has proven itself as a workhorse in hundreds of recycling centres around the world. According to a press release from Iggesund Paperboard, part of the Swedish forest industry group Holmen, a number of global companies have replaced, or are doing trials to replace, the material in their gift cards - from plastic to paperboard. Sweden's largest cinema chain, SF Bio, has taken the plunge and is now replacing all its cards. As part of L'Oréal USA's annual Volunteer Day, held June 12th, Garnier USA recently sponsored an opportunity with TerraCycle and GrowNYC where employees worked to install a community garden at the El Gallo Social Club in Harlem, New York City. The Swedish waste management company Lundstams Återvinning AB and Mared AB have agreed on the delivery of ZenRobotics waste sorting robots to one of their facilities in Northern Sweden. The new sorting line will allow Lundstams to process waste more efficiently and closer to the source. The robotic sorting line is expected to be operational in the first quarter of 2019. Polycoated cartons, both aseptic (shelf-stable) and gable top (refrigerated) were given their own ISRI Paper Stock Industry (PSI) classification - PSI Grade #52 - in 2011. According to Isabelle Faucher, managing director of the Carton Council of Canada (CCC) this was a milestone for the industry. The recycling industry is in the midst of a seismic market shift. The world's largest importer of recycled material, and arguably the world's dumping ground for material with impurities, China, has said "enough" as it grapples with domestic environmental issues. Machinex was recently awarded the bid to provide a new single-stream material recovery system (MRF) for York County, South Carolina. The facility is planned to begin operations this July. This new system will allow the County to process the growing tonnage of residential recycling materials being generated in the surrounding area. Material is coming from 16 collection and recycling centres located throughout the County and this new facility will processes all collected recyclables. Recycling bags could be key to righting Canada's recycling woes, reducing contamination, and capturing lost revenue, according to a new study by researchers at York University. The paper recycling industry has been working diligently over the last several years to improve the quality of the recycling stream. Through a collaborative effort, the Institute of Scrap Recycling Industries' (ISRI) Paper Stock Industries (PSI) Chapter and ISRI's Paper Division - whose members include recyclers, paper mills, MRF operators and other industry stakeholders -- are working to improve the quality of recycled material through a reduction in contamination. This effort recently included an update to the "Guidelines for Paper Stock" in ISRI's Scrap Specifications Circular that among other changes, clearly lists items that are considered "Prohibitive Materials" and should not be included in the recycling stream. In addition, for the first time, "Zero Tolerance" is also defined. The Solid Waste Association of North America (SWANA) announced that Penn Waste has been named the winner of the SWANA Silver Excellence Award in the Recycling Systems category. The award will be presented at SWANA's annual conference, WASTECON, on Wednesday, August 22, 2018, at the Gaylord Opryland in Nashville, Tennessee. The Monterey Regional Waste Management District (MRWMD) recently turned to Bulk Handling Systems (BHS) to provide a turnkey technologically advanced recovery system, designed for processing up to 80 tph on two lines.